While for those of us in more northern climes it seems summer this year never even got started, the fact is that this fickle season will shortly draw to a close and children will once again return to school. South of the border, summer is still in full swing but even here it won’t be too long till school restarts and autumn beckons. Then comes the realisation that holidays have to be paid for and you’re back to earth with a bump! Never mind – with some forward planning, next year’s sunshine break or that big trip with the family several years down the line could become a reality. 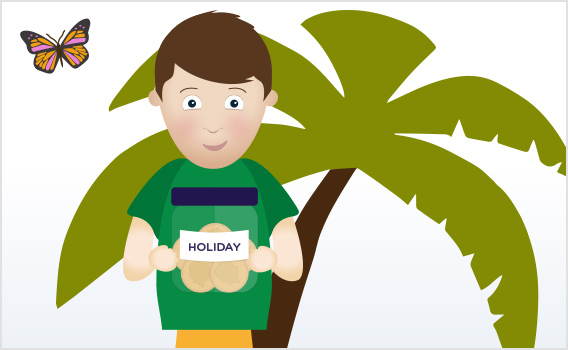 A good starting point for saving money for a holiday is to create a summer budget – try to work out how much you want to spend next summer or for the special holiday in 2020 to cover all your treats and breaks in the sun and tot it all up. You can then set this as your summer saving figure. Once you know what to aim for, it’s time to work out the perfect place to save or invest. If you’re planning a trip in the next year or so, you’ll probably want a deposit based account. But if you want to gradually build up a fund over the coming years and kick-start a savings and investment habit then an Investment ISA could be the ideal place to squirrel away for the future. At Scottish Friendly, we think that investing should be available to all – which is why you can start an Investment ISA with us from just £10 a month or a lump sum from £100. We offer a range of funds so you can choose what’s right for you. A special feature of Scottish Friendly’s ISAs is that you can split your investments into different policies (which we call ‘pots’). So building up money for holidays in the future is made easy as you can give each pot a name and keep track of its value separately. Once you have sorted your plans to create a summer savings pot, you can put yourself on the alert for cost-saving deals. Booking your holiday well in advance can be a great way to save money, so cheer up those dreary winter months by trawling through the holiday offers. Putting yourself ahead of the game also mean that you may be able to pick up an extra discount or two and you may also be able to take advantage of any vouchers that come along. If you’re a member of Scottish Friendly’s My Benefits, you can find some great money saving offers from some of the UK’s leading travel companies. Remember every penny saved can boost your savings pot and give you an extra ray of sunshine whether it’s next year or for a big trip in several years’ time. The value of shares can go down as well as up and you may not get back the amount invested. You should consider this an investment of at least five years. Tax rules can change and depend on individual circumstances.